I am a computer scientist interested in the research and development of autonomous and semi-autonomous robotic systems. I primarily focus on perception algorithms that will allow robots to operate safely and effectively with humans. Please see my research and publications pages for more details. Senior Research Scientist - Neya Systems LLC (2018-present). Principal Robotics Scientist - iMover LLC (2017-2018). Senior Engineering Specialist - Caterpillar Inc (2012-2017). Courtesy faculty appointment - Electrical and Computer Engineering Department at Carnegie Mellon University (2009-2012). 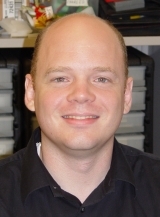 Senior Systems Scientist - The Robotics Institute at Carnegie Mellon University (2005-2012). Postdoctoral fellow - The Robotics Institute at Carnegie Mellon University (2003-2005). PhD (2003) Computer Science and Engineering from the University of Minnesota. MS (2001) Computer Science and Engineering from the University of Minnesota. BA (1995) in Mathematics/Computer Science from Lawrence University.